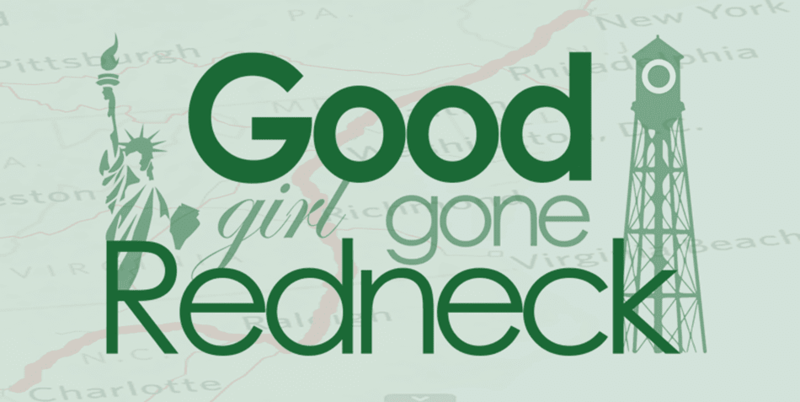 Good Girl Gone Redneck: Overdue Recap. I've got so much to say and my mind just hasn't given me the chance to say it lately. It's Saturday night and today I went to two birthday parties with my daughter, and a baby sprinkle for a friend. It was fun, having a few hours in the midst of 5 and 6yo chaos, to have grown-up conversation. And eat a grown-up meal. I mean ALL DAY LONG. 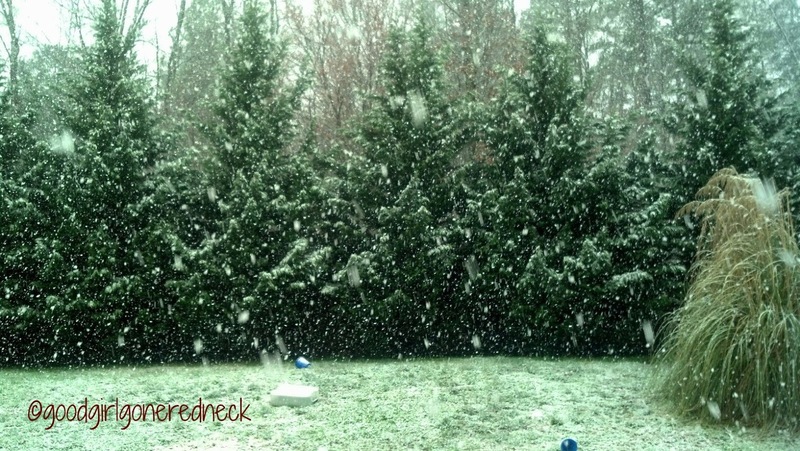 Look at how pretty my backyard looks! And this was only about an hour or so into it all. 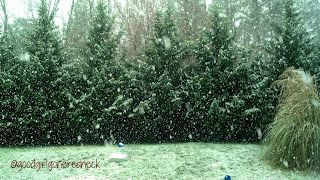 You'd think we'd be knee deep in it by now, but, alas, it's not sticking. So it's pretty, but not much to play in. For the kiddo - of course. Not me. I was happy it was cold enough that I could wear my new (ish-I wore them once or twice before) boots. I bought them before the season with hopes I'd get to wear them at all. And they're cute, and comfortable. And kind of cozy, too. I'm trying to find them on Skechers' website without any luck. But trust me. They're cute. You'd think after a party-filled day that included McDonald's with Daddy and the play area and a cookie, two cupcakes (icing only) and an ice cream dixie cup (are they even called that anymore?) my kiddo would be crashed by now, right? Wrong. She's watching Despicable Me and standing/sliding around with/on her scooter. Oops. By the way? I love this movie. Did you know there is a sequel coming out? I canNOT wait. Seriously. tee hee. Also, if you didn't know, my kiddo turned six last weekend. I started to write a post and just let myself get caught up in celebrating her and enjoying our time together and decided, you know what? I'm going to skip it. For the time being, anyway. It's all good. Let's just say she had a great day. I was over at Shell's place yesterday. I shared my Things I Can't Say post. I had a lot to say. Not that I can't say it here, or won't, since I say almost any and everything, it just was something that came to me and seemed right. 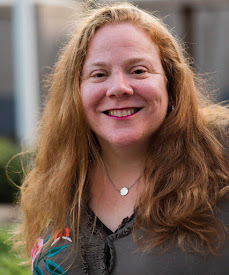 So I talk Mommy/Women Wars and I would love if you popped by and left a comment if you feel so inspired. Or not. It's all good with me. And tomorrow or Monday I'll be over at Mama's Comfort Camp posting about my experience there and thoughts about what a new mom, old mom, ANY mom needs for her support system. Feel free to peek in over there and if I'm not up yet forgive me. I'll do my best to update as soon as I know it's live. Alright, I think that's it. I'm tired. I need my own bed. Oh, I also am monitoring my steps now. I got a FitBit Zip from Verizon Wireless (I'm a #VZWA - I think you knew that by now, but if not check it by looking up the hashtag on Twitter, because I'm too lazy to provide you a link here.) and am pretty excited. It's attached to me at al(most)l times. We'll see how it goes when I use it for the full day, because today's total steps is pretty dinky and I'm not sure I'm believing it. Anyway - hi and hugs and bye and love and all that jazz to you all. Also? What's with all these Facebook "meme" type things that ask you to name a movie title without an "s" in it (as if that's hard!) and a fruit or vegetable without an "a" (much, MUCH harder!)? I'm too tired to think about this hooey AND I need to stop a cat from attacking a box from a case of - fortunately empty - Girl Scout Cookies. And remember, Operation Cookie Drop, where you give to those who give so much to us all. $3.50, people. That. Is. All. Also, GS cookies cost $4 here in NYC. AND, we had to sell them during the holidays. Ugh and double ugh. I haven't heard of the FB meme thing either...but I didn't look at FB much this weekend. I'm going to have to check that out! We had the pretty snow, but there was enough to play around in at least for the night. It all went away by mid-day on Sunday. But it was pretty while it lasted!